According to Home Ministry, at least 5,017 died and around 10,224 people have been injured as of Wednesday evening. The first good view of the aftermath of Nepal’s deadly earthquake from a satellite reveals that a broad swath of ground near Kathmandu lifted vertically, by about 3 feet (1 meter), which could explain why damage in the city was so severe. The new information comes from Europe’s Sentinel-1a radar satellite. According to the early analysis, a region 75 miles (120 kilometres) long by 30 miles (50 km) wide lifted upwards by as much as a 3 feet during the earthquake, said Tim Wright, a geophysicist at the University of Leeds in the United Kingdom. This uplift peaked only 10 miles (17 km) from Kathmandu, even though the city was relatively far from the earthquake’s epicentre. That’s one of the reasons why Kathmandu has so much damage. Tropical cyclone 24s (Quang), located approximately 358 nm northwest of Learmonth, Australia, is tracking southeastward at 10 knots. Australia – A new low pressure weather system off Australia’s east coast has parts of southern Queensland and northern NSW bracing for heavy falls and near-cyclonic wind this weekend. South-east Queensland including the Fraser Coast, Gold Coast and inland to the Darling Downs is set to receive falls of up to 400mm this afternoon and tomorrow. Ukraine’s emergency services appealed for calm Wednesday as wildfires raged in the exclusion zone surrounding the Chernobyl nuclear power plant in Ukraine that went into meltdown in 1986. There had been concerns that wildfires in areas contaminated by the Chernobyl accident would release radioactive elements back into the air that would travel with the smoke and contaminate new areas, potentially posing an increased cancer risk to the inhabitants of those areas. A 30 kilometre radius around the old power plant marks the exclusion zone, an area in which parts of land exceed the International Atomic Energy Agency’s radioactive contamination standard. Ukrainian Prime Minister Arseniy Yatsenyuk said the blaze was under control and had been contained to an area 20 kilometres from the plant, The Associated Press reported. Environmental organization Greenpeace on Wednesday expressed concern that the Ukrainian government could be downplaying the extent of the fire. The AP cited officials as saying the blaze had swept through 400 hectares (1.5 square miles) of woodland on Tuesday. Greenpeace said in a statement that the affected area — including woodland, drained peat bogs and fields — extended to some 10,000 hectares. Sunday marked the 29th anniversary of the Chernobyl disaster that caused the deaths of at least 28 people from acute radiation sickness, increased the incidence of cancers in areas of today’s Ukraine and Belarus and contaminated vast areas of land, according to the UNSCEAR report on the accident. Sinabung (Sumatra, Indonesia): A series of strong pyroclastic flows occurred yesterday 28 April 2015, reaching 3-4.5 km distance. The largest, at 18:20 local time touched and burnt the (evacuated) village of Guru Kinayan on the southern slope of the volcano. The flows, at least 9 in total, were results of the partial collapse of the recently emplaced lava lobe on the steep upper flank. They occurred at 17:02, 17:20, 17:33, 17:44, 17:47, 17:50, 18:03, 18:20 (probably the largest one), and at 19:52 local time. Dempo (Sumatra): PVMBG raised the alert level of the volcano to 2 (waspada, “watch” on a scale of 1-4) because of increased seismic activity (mainly tremor and volcanic-tectonic earthquakes). It is recommended not to approach the crater within 1 km. Piton de la Fournaise (La Réunion): A new eruption could be on its way at the volcano. A sharp increase in volcanic CO2 emissions, significant deformation of the Dolomieu crater, and a migration of earthquakes from deep to shallow (7 km) levels, as well as earthquakes near the surface itself that have appeared over the past weekend suggest new magma is on its rise to a possible new eruption, which would be the second in 2015. 5.5 Earthquake hits Oaxaca, Mexico. 5.3 Earthquake hits near the coast of Ecuador. 5.0 Earthquake hits the State of Chuuk, Micronesia. 5.0 Earthquake hits off the coast of Central America. Tropical cyclone 24s (Quang), located approximately 494 nm northwest of Learmonth, Australia, is tracking west-southwestward at 06 knots. Switzerland – On Monday 27 April 2015 flash floods hit the communes of Blonay and St-Légier situated above Montreux and Vevey in the Swiss canton of Vaud. Heavy rain fell for around one hour and water came rushing down streets without warning. Kenya – Search and rescue efforts were underway in Narok on Wednesday after flash floods claimed nine lives on Tuesday. Between 1 January and 25 April 2015, the Ministry of Public Health of Niger notified WHO of 1543 suspected cases of meningococcal disease, including 147 deaths. Suspected cases have been reported in seven of Niger’s eight regions. Meningococcal meningitis outbreaks have been confirmed in several areas of Dosso and Niamey regions. The risk of serious diseases including diarrhoea and skin allergies are looming high in earthquake-battered Nepal due to the countless animal corpses lying out in the open. The lack of proper food, unhygienic surroundings and the lack of specialised doctors to treat the patients have accelerated the problems. 5.2 Earthquake hits the India-Bangladesh border. 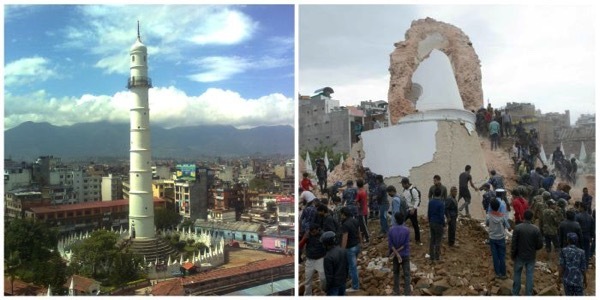 The official death toll for Saturday’s earthquake has currently stands at 4,349, with more than 6,500 injured, as the nation struggles to provide relief to thousands of survivors. Heavy rain has added to the hardship of thousands of people forced to sleep rough for a fourth night , after the earthquake destroyed their homes. Water, food and power are scarce, raising fears of waterborne diseases. The UN estimates that eight million people have been affected by the earthquake. The World Food Programme says 1.4 million people are in need of immediate help. New Zealand = Heavy, localised rain early on Tuesday caused homes in Newtown to flood, an underground car park to fill with water, and water to threaten homes in Kilbirnie. Texas, USA – Last night’s storms have caused flooding, property damage, and numerous power outages leaving thousands of East Texans in the dark. Heavy rains also flooded parts of Forth Worth. Florida, USA – Severe weather saw many Baton Rouge neighbourhoods have limbs and trees down from high winds which were also to blame for power outages and damage scattered all over the Metro area. The LA fire department said 10 homes were under threat and residents had been evacuated. There have been no immediate reports of injury or damage to nearby luxury homes as fire crews struggled with the wind-driven flames as they burned a nearby canyon and throwing smoke over Los Angeles. Kilauea (Hawai’i): The lava lake inside the summit caldera’s Halema’uma’u crater has been constantly rising since 22 April and is now about to overflow. HVO reported that inflation continued and as of yesterday, the lava lake had risen to within about 2 m (~7 ft) of the Overlook crater rim. Parts of the lava lake are already visible from the overlook area at the Jaggar museum. 5.4 Earthquake hits near the coast of northern Peru. The death toll following the 7.5 earthquake has risen to 3 600 with several thousand others injured. The situation in Nepal is chaotic with infrastructure destroyed and many remote villages remain cut off by landslides and without communications. Pakistan – At least 44 people have been killed and more than 200 injured after a storm struck Pakistan’s north-west city of Peshawar causing dozens of buildings to collapse, officials have said. Intense rain and strong winds buffeted the city and adjacent districts late on Sunday, felling trees, causing dozens of roofs and walls to collapse and blocking many roads. Floodwater from torrential rainfall had reached one metre deep in some parts of the city of more than 3 million people. Karymsky (Kamchatka): An explosion occurred this morning that was strong enough to produce an ash plume to approx. 10,000 ft (3 km) altitude (VAAC Tokyo). Sakurajima (Kyushu, Japan): Strong activity continues from the volcano. This morning (14:24 local time), an explosion at the Showa crater sent a plume to 15,000 ft (4.5 km) altitude that drifted north. Manam (Papua New Guinea): Eruptive activity is taking place at the volcano. VAAC Darwin reported an ash plume to 8,000 ft from the volcano this morning. A pronounced SO2 plume can be seen on satellite data as well. Dukono (Halmahera): The volcano continues to produce significant ash emissions – a plume extending 20 nautical miles E was observed Saturday (Darwin VAAC). Calbuco (Southern Chile and Argentina): Activity has been lower yesterday, but weak ash emissions continued at least intermittently. Sernageomin reported decreasing levels of seismic activity yesterday, dominated by 283 volcanic-tectonic quakes mostly at 8 km depth, as well as weak volcanic tremor. It is unclear whether the eruptive phase is ending or heading towards a new phase of magmatic activity, with the possible scenario of new larger explosive and/or effusive (lava flows, lava dome emplacement) activity. A main hazard at the moment is the occurrence of lahars, mudflows that are generated when rainwater mobilizes the abundant fresh ash deposits. Barren Island (Indian Ocean): A pilot reported an ash plume rising to 10,000 ft from the volcano. Likely, eruptive activity which had produced a new lava flow in March is still going on or has resumed. 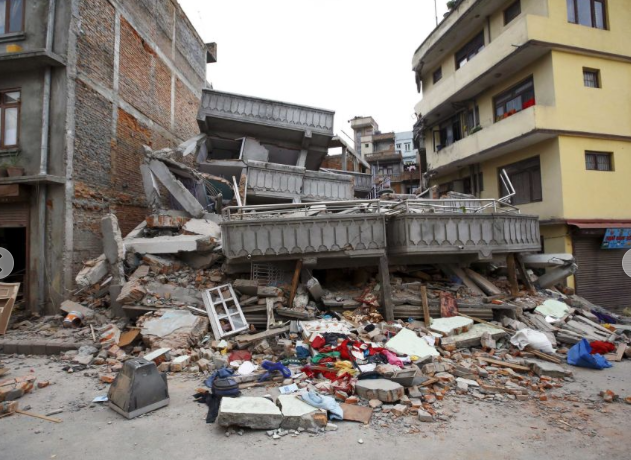 Police now put the death toll in Nepal at 2,152, with more than 5,000 hurt. At least 700 were killed in the capital, a city of about 1 million people where many homes are old, poorly built and packed close together. The overall toll from the quake was expected to be much higher, and at least 49 people have died in neighbouring India. Terrified residents of Kathmandu were woken by fresh aftershocks in the worst disaster to hit the impoverished Himalayan nation in more than 80 years, with many forced to spend the night trying to sleep out on the streets and open ground in makeshift tents. Hospitals were so stretched that medics had set up tents outside the buildings to treat patients. 5.7 Earthquake hits western Xizang, China. 5.6 Earthquake hits the Nepal-India border. 5.4 Earthquake hits the Xizang-Nepal border. 5.3 Earthquake hits north of Halmahera, Indonesia. Five 5.0 Earthquakes hit Nepal. 5.0 Earthquake hits the Xizang-Nepal border.